Say the name Pocahontas and I bet you immediately think Indian princess or the Disney movie. But did you know Pocahontas converted to Christianity, or that she died when she was only 22? This lovely picture book uses beautiful watercolor paintings and interesting facts to tell a fascinating story of Pocahontas. She was a peacemaker and a spirited girl who loved to do cartwheels! And it was her intervention that spared the life of John Smith, captain of the English settlers. Your girls especially will be inspired by Pocahontas’ testimony and peaceful ways – she surely is a princess and a fine example of faith and courage. The back of the book has an index of fact questions (fill in the blank) as well as questions for discussion. There are also illustrator’s notes that explain the symbols the artist used throughout the book. Why not read the story and make your own watercolor pictures of Pocahontas? 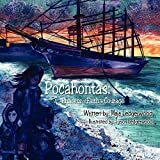 Enjoy the book itself or combine it with other resources listed below for a unit study on the life of Pocahontas.